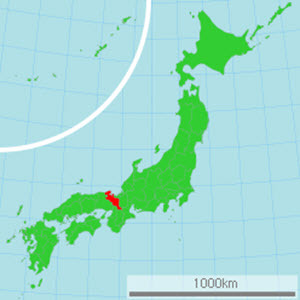 The Kyoto Prefecture (Kyōto-fu ) is one of only two urban prefectures (fu) in Japan, the other one being the Osaka Prefecture (Ōsaka-fu). The Kyoto Prefecture is located in Japan’s Kansai region, almost in the centre of Honshu, and with the Sea of Japan to the north. The Tanba Mountains run through prefecture from east to west, dividing it onto two distinct parts. The capital of the prefecture is Koyoto City (Kyōto-shi), which for over a thousand years was the capital of Japan. Today, it is a part of the large Kyoto-Osaka-Kobe metropolitan area. The city became the imperial capital in 794 AD when Emperor Kanmu moved his seat to what was then known as Heian-kyo. This would have a profound effect on the city, and even today, the outlay of the central city is largely the same as back then, with streets, buildings, temples and shrines situated in their ancient locations. Kyōto-shi remained the capital of Japan until the 1860s when Emperor Meiji moved his seat to Edo (and changed Edo’s name to Tokyo). Even after the move, Kyoto remained a very important cultural focal point in the empire. Until the Meiji Restoration in the 1860s, the area that is now the Kyoto Prefecture was known as Yamashiro. The Sanin Kaigan National Park is over 87 square kilometres in size and runs continously along the Sea of Japan coast from Tottori to Kyotango, which means that it contains land three different prefectures: Tottori Prefecture, Hyogo Prefecture and Kyoto Prefecture. Established in 1963, this national park is known for its geological diversity with many caves, rock formations and islands. The whole national park is located within the 2,450+ square kilometer Sani’n Kaigan Global Geopark that was established in 2008 and became a UNESCO Global Geopark in 2010.